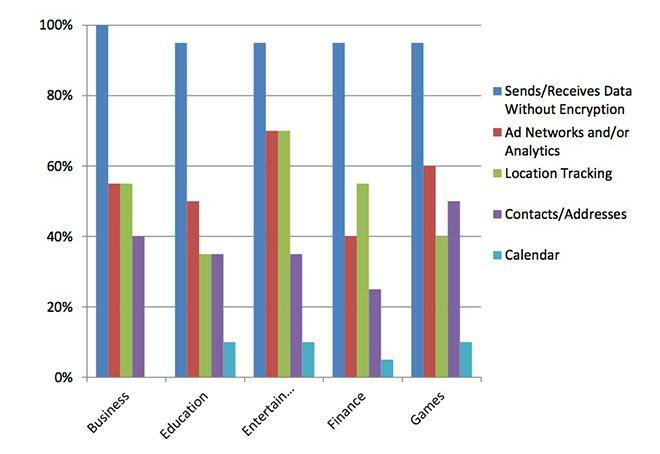 Appthority's App Report for February 2013 looked at the top performing free mobile apps across both iOS and Android, as free mobile apps are more likely to rely ad networks and analytics companies as a means of generating revenue. Despite Android's reputation as a less secure platform, Appthority found that it was iOS apps that are allowed to engage in more risky behaviors. The study found that all 50 of the top free iOS apps  and 92 percent of the top 50 free Android apps  send and receive data without encryption. iOS apps get more access to user data, with 60 percent of the top apps tracking user location, 54 percent having access to a user's contact list, 60 percent sharing data with ad or analytics networks, and 14 percent accessing users' calendars. 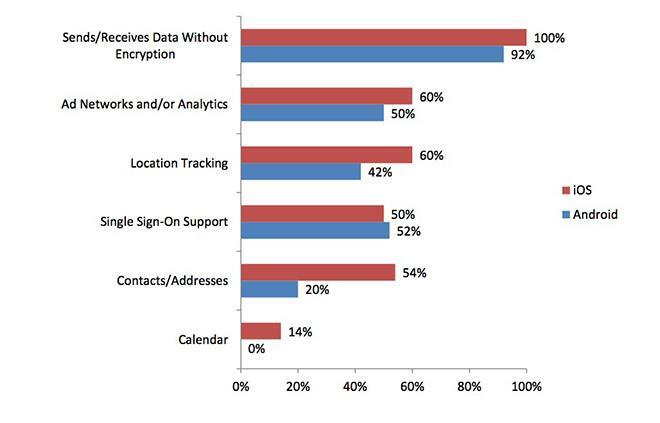 Fifty percent of Android apps shared data with ad networks, while 42 percent tracked user locations. Only 20 percent of Android apps, though, had access to users' contact lists, and none were found to access the calendar. Entertainment apps were found to be the loosest with user data, with games and business apps close behind. Educational and finance apps were found to display the fewest risky behaviors. A number of questionable policies and security concerns have painted Google's Android platform as inherently less secure than Apple's iOS. Android does appear to be more vulnerable to malware than iOS, but mobile malware affects only one percent of apps. The larger concern, the study concludes, should be over how mobile apps handle personal information and company data.